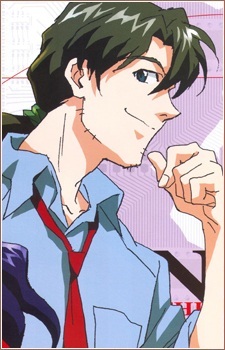 Kaji, while only being a special inspector, secretly works for SEELE investigating NERV's true intentions. He is always called by his last name, Kaji. During college, he had a serious relationship with Misato, but after having long broken up, they see each other again on the UN fleet ferrying Unit 02 and its pilot, Asuka Langley Soryu, to Japan. After he returns to NERV headquarters, Kaji and Misato rekindle their romance following a period of teasing and insults, when Misato confesses that she broke up with him because she realized that Kaji reminded her of her father. He is eventually shot by an unnamed assailant, described as "a third party working either for SEELE or for NERV's Intelligence Division" in the episode Film-book. In the manga, it is Commander Ikari who personally kills Kaji.